Pour en savoir plus : Bordeaux, Sites of Justice. The Bar of Bordeaux is one of oldest in France. As in a lot of millennial cities, the activity of lawyers there is as old as the city itself and becomes one with the history of the City. One of the oldest bas-reliefs (Ist or 2nd century A.D.), recovered in the soil of the city represents a lawsuit before a local judge. Golden era of the Gallo-Roman period with the Bordeaux rhetorical school, professors of oratory reputed in Spain, in Rome or Constantinople who were also lawyers at the same time. Ausonius (310-394) pleaded, before becoming a poet and grammarian ("nec fora non celebrata mihi ") and going to Trier in 367 at the request of Emperor Valentinian to act as tutor to the young Gratian. Latinus Alcimus Alethius shared his time between the forum and the school. 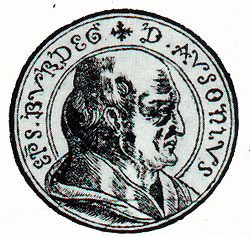 The uncle of Ausonius, Aemilius Magnus Arborius, after pleading in Bordeaux, went to Toulouse, the Narbonne region, in Novempopulania and Cictercian Hispania . The most famous remains Attius Tiro Delphidius, quoted by Gibbon as the vehement Delphidius, who prosecuted for extortion, the president of the Narbonnese province in Emperor Julian Court, in 358. At the end of the trial, as it was plain that Delphidius, had presented insufficient evidence upon which to convict the defendant, who had maintained his innocence and presented no evidence of his own, Delphidius exclaimed,“ ‘Oh, illustrious Caesar! If it is sufficient to deny, what hereafter will become of the guilty?’ to which Julian replied, ‘If it suffices to accuse, what will become of the innocent?” The anecdote is always quoted as illustrating the roots of presumption of innocence even in US Supreme Court Case Law. (See Coffin v. United States, 1895). The oldest known lawyer is Ramon of Léon, and the Coutuma de la vila de Bordeu records that he pleaded in the year of the Lord 1293. Every year, from 1375 to 1393, on the occasion of the election of the new Jurates, lawyers swore not to take on any disreputable case, or say anything either contrary to their customs, to their beliefs or their conscience, but to plead fairly, without prevaricating,or doing anything to harm the jurisdiction of the Mayor and Jurates. (" Livre des Bouillons " of the City of Bordeaux). 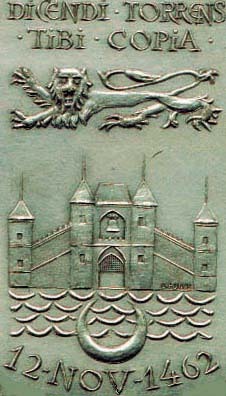 In 1451, at the time of the return of Aquitaine to the Crown of France, King Charles VII conceded the creation of the Parliament of Bordeaux. This made the Parliament of Bordeaux the third oldest in France, after Paris and Toulouse. However, a year after the capitulation, Bordeaux revolted and called back the English, the treaty was forgotten, and there is no evidence that the King of France ever had time to set up sovereign justice. So, the question never arose after the second subjugation of Bordeaux in 1453 and from that time sovereign justice over Guyenne was attributed to the Parliament of Paris. 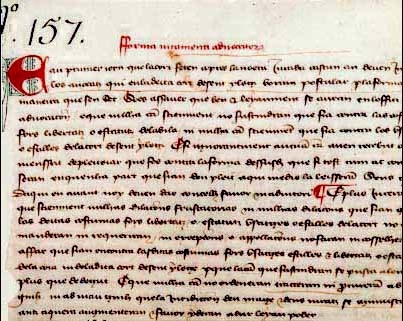 Louis XI dedicated the creation of the Bar of Bordeaux indirectly on June 12th I462, by his decree (" lettres patentes "), signed in Chinon, for the establishment of the Parliament of Bordeaux and it was only from that date that it could trace a continuous history. The Parliament came into office the same year, the day after Saint-Martin’s Day. The solemn opening audience took place in the former Palace de l’Ombrière, "Castrum Umbrariae", which got its name from the shade created on the front room, by the trees in the avenue and under which the provost once pronounced sentence, on November 12th 1462. This date marks the birth of the Bar and figures at the bottom of the obverse side of the Medal. Indeed, from this date, the Bar was organised on a basis that lasted until the beginning of the XXth century. The Confraternity will one century later become the Company, then the Order of Lawyers. The oldest registered person is the dean and, every year, two syndics are nominated by the Parliament, selected from a list of six candidates, composed of three former lawyers - chosen from the first half of the list of registered persons, and three others from the second half. On May 19th every year, on Saint Yves’ Day, the patron saint of the Confraternity and District Attornies, was the festival for the whole Court. The Parliament of Bordeaux was the supreme court of appeal for a jurisdiction of over 2 million souls. Throughout most of the three centuries of its existence the Parliament heard final appeals from 30 seneschaley courts, and hundreds of royal and seignorial courts of first instance, covering Guyenne, Gascony, the Landes, the Agen region, Labourd, Limousin, Périgord, the Bazas region, and Saintonge. The law by which this vast jurisdiction, the fourth largest in France, regulated its affairs, was Roman law for the most part, its authority being modified in certain districts by a series of local customs, such as that of Bordeaux itself. 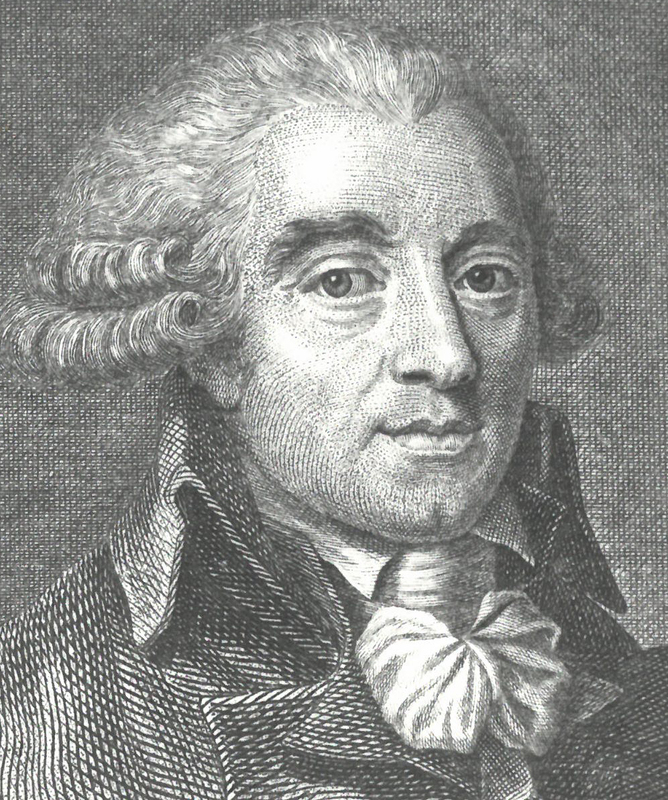 Guillaume Le Blanc and the "commune of Guyenne "
In the same way as the English defeat encouraged the birth of an organised Bar council, it was a revolt against the salt tax, called the " gabelle " which promoted one of the Bar members to a priviledged position in the administration and the recognition of his fellow citizens. Again one would be tempted to say that the tax, extremely unpopular in Guyenne, in the last years of the reign of King Francis I , and during the first months of that of Henry II, was probably a pretext rather than a real explanation for the insurrection. The return of Bordeaux to French power was based on fragile roots, since it had been in English hands only a century earlier. In the space of a few days in the of summer 1548, the anger of the inhabitants of the countryside spread to the city and the revolt which was later know as the "Commune of Guyenne" led to part of the city being set on fire, to the murder by the crowd of the king's General Lieutenant, Tristan de Moneins, then to a savage repression ordered by the King and carried out by the Connétable de Montmorency. No one was spared there, not even the Jurates, suspected of being sympathisers. Bordeaux lost its exemptions and municipal administration, and its Parliament was outlawed. Neither entreaties, nor offers of tribute could abate the King's anger. While there seemed to be no other choice than that of submitting to servitude, as a last resort, the town turned to, Guillaume Le Blanc, " Avocat à la Cour du Parlement ", considered as the "best" at that time, entrusting him with the responsibility of pleading and obtaining royal forgiveness for the shattered town. The King, though far from being impartial in this case, one year later granted forgiveness, freeing the town of the rigorous punishment that had been inflicted on it. Never had a lawyer been more cherished in the heart of his fellow citizens than Guillaume Le Blanc whose fine deed sealed a bond between the Bar and the State, while exemplifying Bordeaux’s tempestuous love affair with the Monarchy. Bernard de Laburthe, a peer and friend of Guillaume Le Blanc, was on his side, as well as Jean de Lange one of the most brilliant and erudite lawyers of his day. Jean de Lange spurned compromise, excess and the disgrace of a regime that seemed to be bent on becoming more despicable every day. He attacked the insolent nobility, the rapacious clergy, those who held official posts, those who were influential in court, members of the judiciary itself, and, fearlessly spoke out for the " tiers état ". His harangue of the people and the " tiers état " of all France to the very devout Charles IX, who had his " Etats Généraux " in the town of Orleans, on the first day of January 1560, had a resounding effect on the whole of France. 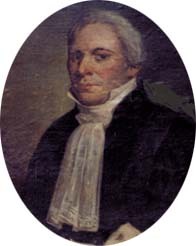 It is also necessary to mention another lawyer, Pierre de Lancre , who was some years later to become the object of controversial celebrity by the terrifying repression that he led on sorcery in the Labour when, having become an advisor in the Court of the Parliament of Bordeaux, he became a delegate for the Basque Country. It was said that : " His justice was as expeditious as it was bloody, and the sectarian judge did not flinch where torture or burning were concerned ". 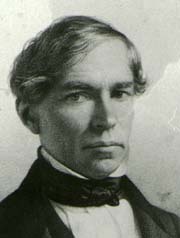 As well as orators, the Bar also produced writers, and some of them are still well known today. For example, Pierre de Brach (1547 - 1605), went on to lecture in case law at the University of Toulouse, which had become famous because of the lectures given there by Cujas. As a young poet, in around 1567, he won the Églantine prize, at the same time as Ronsard was receiving a solid silver Minerva from the Floral academy " considering the Eglantine too small a prize for so great a poet". Back in Bordeaux, he became a lawyer. Pierre de Brach had translated Tasso and Ariosto. Like many of his peers, he was familiar with Latin and Italian literature. 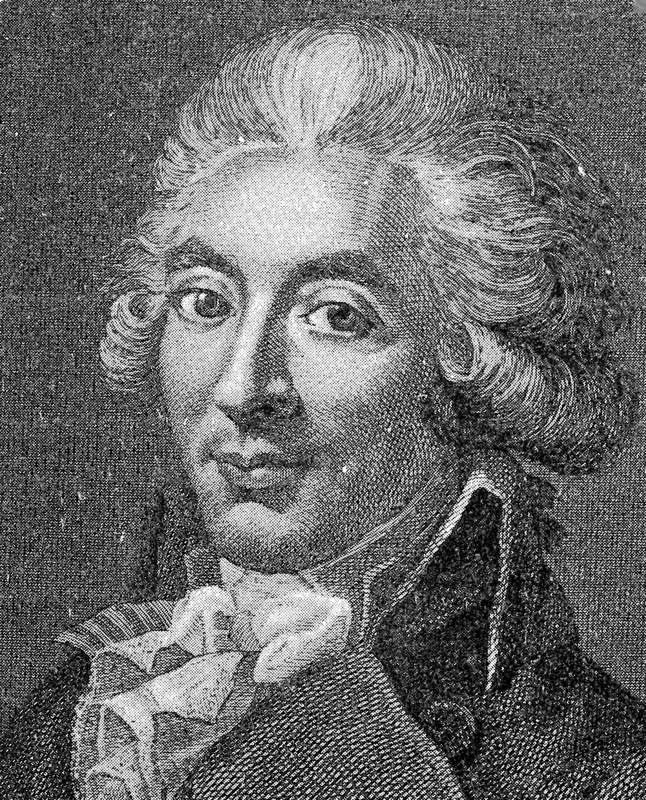 He had illustrious friends: Guillaume de Salluste du Bartas, author of the famous " Semaine ", Montaigne, and by the way of the death of who was a close friend of his and on whose death he wrote his famous " Letter on the death of Montaigne ", as well as the greatest wits, the great scientists and poets of the XVth century, and Ronsard, Jacques Pelletier, Pasquier, among others. In 1577, having gained the favour of Marguerite of Navarre, he obtained the post of advisor to the King and and the post of inspector in the Chancery of Bordeaux. After 1560, the Bar counted more than a hundred and fifty registered lawyers, organised around their Syndic, a post which remained until the Revolution, and it had more than two hundred members in 1611. 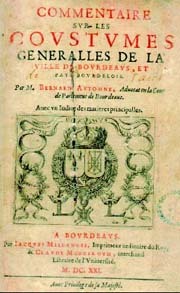 The most famour lawyers in Bordeaux during the 17 century, were François de Bonalgues, Jean de Poitevin, Jean de Malvyn, François de Roquette, Etienne de Brethous. And also a first dynasty of the Bar illustrates the century : François, Jacques and Jean de Fonteneil . Estienne Cleirac, lawyer in Bordeaux (1583-1657), published Les Us, et Coutumes de la Mer, Divisés en Trois Parties. I. De la Navigation. II. Du Commerce Naval & Contrats Maritimes. III. De la Jurisdiction de la Marine. 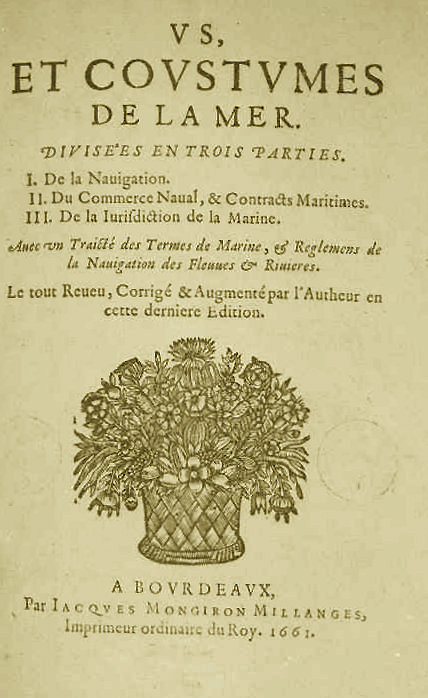 Avec un Traitte der Termes de Marine, Reglements de la Navigation des Fleuves & Rivieres; Et les Nouveaux Edits, Reglements, Arrests, & Iugements Rendus sur la Fait du Commerce de la Mer. including index and incorporates treatise originally published in 1634 with special title page: Explication des Termes de Marine Employez par les Edits, Ordonnances et Reglemens de l’Admirauté. 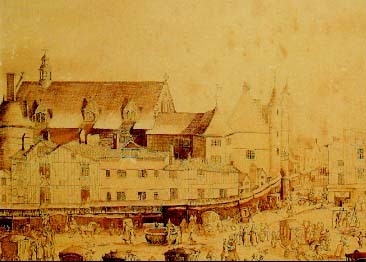 chez by printer Guillaume Millanges, in 1647 à Bordeaux, avec un « Traicté de termes de Marine, & règlemens de la Navigation des Fleuves & Rivières ». This collection of maritime law was soon translated into English and Dutch and edited several times, even in Rouen, Chez Jean Bethelin, in 1671. It remained influential until the end of the eighteenth century. Thomas Jefferson, who owned an edition from 1661, was one of many who respected its authority.“Cleirac’s book is not merely a compilation; it is enriched with copious and learned notes, which entitle him to be placed in the very first rank of maritime jurists. His writings are the source from which Lord Mansfield obtained some of the best principles of common law now prevailing in England.” Marvin 200. Kress R1286 Sowerby II: 2121. The most original of all was certainly, Pierre Trichet, (1586-1644). It has a cabinet of curiosities and collects the instruments. Bibliophile, it is also in relation to poets and scientists. 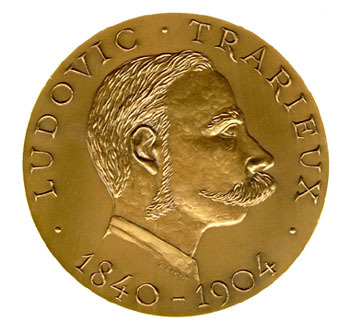 the first created in Bordeaux -and was a collector of mucic instruments . He wrote a Traité des instruments de musique, 1640, discovered only in the XXth century but yet considered as the best way to know intrumental music of the period. 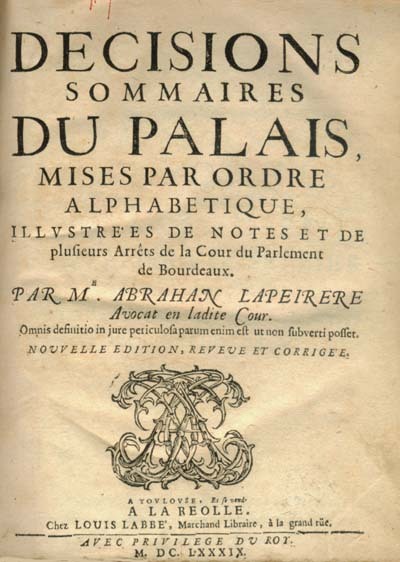 Abraham Lapeyrère publishes for the first time the Décisions sommaires du palais,which remain in favour till the XVIIIth century. ». edited several times till 1807, also in Toulouse in 1689. The classic "Golden Era "
Of the economic golden era of XVIIIth century, the blossoming of a new Bar and a period of unprecedented pomp. Montesquieu becomes a lawyer at the Parliament of Bordeaux. 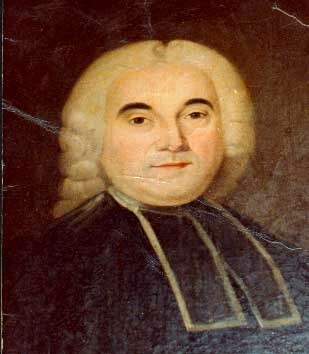 Birth of Jean de Sèze, (1709-1777), lawyer at the Bar of Bordeaux from 1736. Birth of Joseph Duranteau called "the Great" (1711-1790). 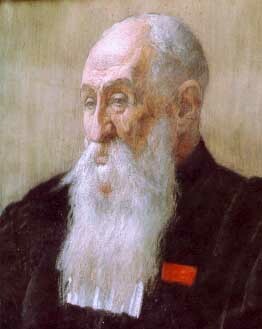 He was the last Dean of the "Company" during the old regime. The second half of the 17th century was dedicated not only to the talents of Jean de Sèze and Joseph Duranteau, the last Dean of the Order of the Ancien Regime, those of Guillaume Brochon (1729-1814), a legal expert of high lineage and also an ethical archetype. All three represent the classic Bar in its heyday, with its intangible traditions and its peaceful evolution in a parliamentary city. This first "Triumvirate" (without forgetting Martignac, senior), reigned over the Bar of Bordeaux until the dawn of the Revolution, even ensuring an interrupted line to the present day, thanks to their judicial progeny, as far as de Sèze and Brochon are concerned. 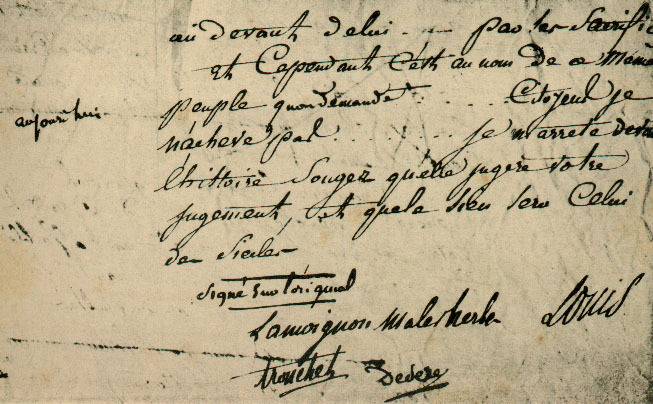 Five Bordeaux lawyers for " the Judgement of History "
Enrollment at the Bar of Bordeaux of Pierre Victurnien Vergniaud (1753-1793). He pleaded there until 1791. Along With Arnaud Gensonné (1758-1793) and Daisy-Elie Guadet (1758-1794), they gave their name to the " Girondins " of the French Revolution. They became the "Triumvirate of the Gironde". 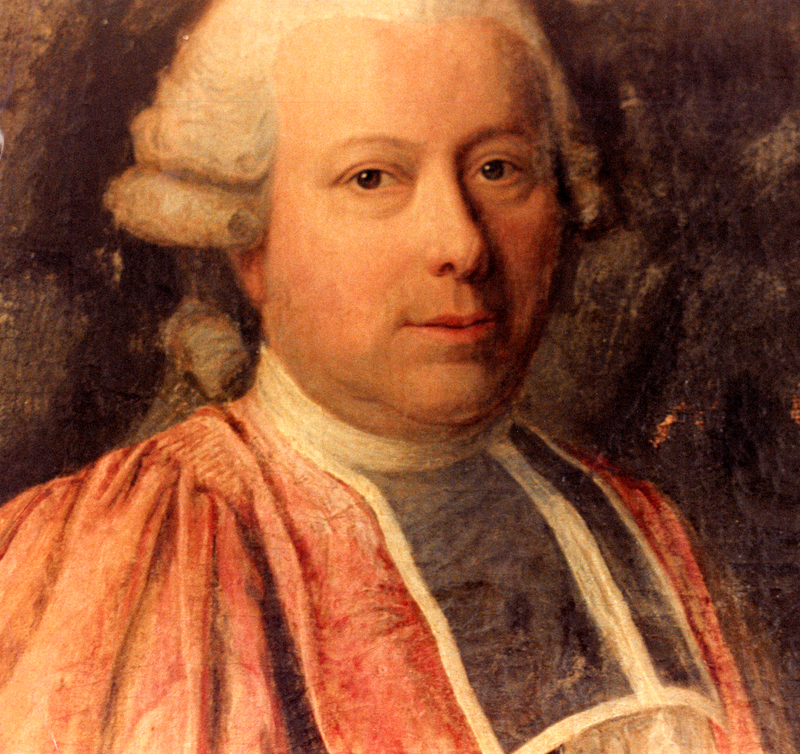 But in fact, as usual, they were four with Jean Antoine Laffargue de Grangeneuve (1751-1793). 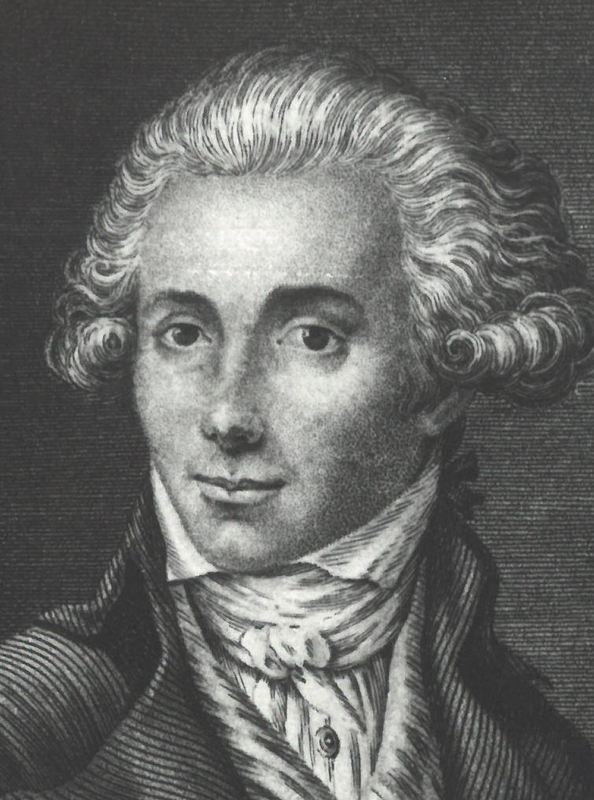 In March, Raymond so-called Romain de Sèze , the son of Jean, (1748-1828) left Bordeaux for Paris. 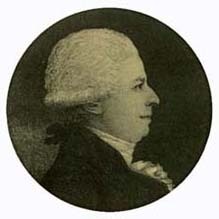 He became the lawyer of Louis XVI in front of the Convention. Suppression of Orders. Institution of " défenseurs officieux ". Guadet was guillotined in Bordeaux on 19th June1794. The death of the last of the four marks the end of the Girondine era. In Thermidor, the Bar of Bordeaux was decimated twice. Twenty-eight of its one hundred and fifty members died on the scaffold in 1790. Romain de Sèze, surviving the torments of the Terreur, got ready to climb all the echelons of the judicial and academic hierarchy, the Bar of Bordeaux recouped the confirmed glories that had forged its reputation in the final blaze of the Ancien Regime. Their mission, henceforth: to recreate lawyers while purifying men of law and unofficial defenders of the Revolution and restoring the Orders that had been done away with in 1790. Surprisingly, the Bar of Bordeaux almost spontaneously regains the ethical rules that everyone clings to like an intangible moral heritage. Around the patriarch Guillaume Brochon, the spontaneous creation of an order takes place, sixteen years after its disparition : deliberations, disciplinary measures of ostracism and collective requests to the " Grand Juge ", the Minister of Justice. In December 18, 1810 decree, the Orders are re-established. The former "Company" becomes the "Order". Guillaume Brochon lets J. Leonard Gaye de Martignac, also known as Martignac Senior (1742-1820) have the honour of becoming the first President of the Bar of Bordeaux, designated by the procurator-general of the Imperial Court. On March 12th 1814, Bordeaux, the legitimist stronghold, comes up against Wellington’s troops and those of the Duke of Angoulême, the nephew of the future Louis XVIII. Without waiting for very long, the Bar, through its Bar President (Denucé) proclaims its infallible fidelity to the Bourbons and keeps its word during the Hundred Days’ War, becoming the crucible of the political personnel of the Restoration. Joseph-Louis Lainé (1767-1835), President of "La Chambre Introuvable", then Home Minister, Auguste Ravez (1770-1849) being in 1818 his successor at the head of the Chamber. 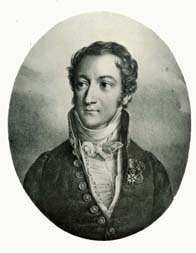 Pierre-Denis Peyronnet ,(1778-1854), Minister of Justice (until 1828). 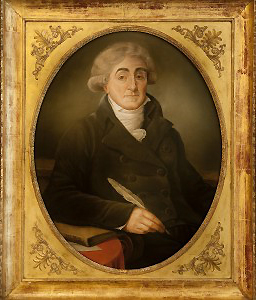 Martignac fils ,(1776-1832) between Villèle and Polignac, gives his name to one of the governments of Charles X.
Peyronnet , the Home Minister since 1829, in the Polignac cabinet, signs the " ordonnances scélérates " of July 1830, that will seal the fate of Charles X. The legitimist tradition will remain sufficiently strong for the Bar to constantly provide legitimist deputies until the beginning of the IIIrd Republic. Institution of the " Conférence du Stage ", by Louis Brochon. Jules Dufaure, (1798-1881), a phenomenon of professional longevity and politics is elected President of the Bar of Bordeaux, (He will be a Minister in 1839, under the July Monarchy in 1848, under the IInd Republic, President of the Bar of Paris in 1862, a member of the French Academy in 1864, under the Second Empire, and in 1871, Vice-President of the government and Minister of Justice in 1871, under the IIIrd Republic). Inauguration of the Law-courts, housing the Assize Court, the Court of Appeal, the Civil Court (to-day Court of First Instance) and other jurisdictions. 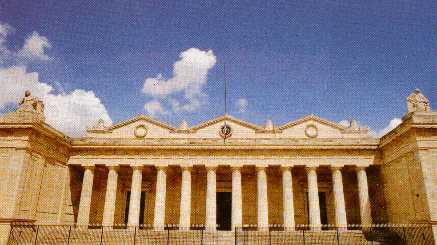 The Law-courts of Bordeaux inaugurated in 1846. Election of Ludovic Trarieux (1840-1904), fervent républicain, president of the Bar in 1877. Ludovic Trarieux becomes Minister of Justice. 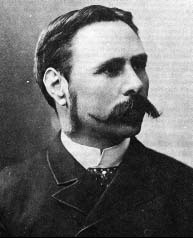 Witness for Emile Zola after "J’accuse..." published in L’Aurore, Ludovic Trarieux declares war on injustice and intolerance while founding the "League for the Defence of Human Rights and the Citizen". The president of the Paris Bar, Payen wrote: "The Bar of Bordeaux is maybe the most famous of all the Bars of France." 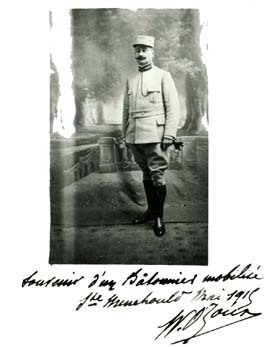 In June 1914, Welcome 0'Zoux, author of " The Revolution of 1848 and the emancipation of slaves on the island of Bourbon " (Réunion) is elected as the president of the Bar. Mobilized some weeks after, he won't take up his duty but after the armistice of 1918. Thirty-four lawyers of the bar of Bordeaux fell during the wold war 1914-1918. 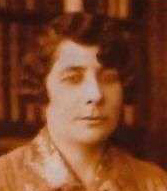 Manon Cormier (1896-1945), is deported to Ravensbrûck. She will die on her return, on May 25th 1945. Three lawyers or former lawyers of the Bar of Bordeaux (including a former President of the Bar) are members of the departmental Liberation Committee. In opposition to these important figures of political life are those who preferred to devote their courage and talent to the courtroom. A certain number of them distinguished themselves by their merit. The past was a prestigious reference for them: Jean de Sèze, turned down the Jurade to dedicate himself exclusively "to exercising" his profession. The Restoration offered them a model that was already of ethical value : Philippe Ferrère (1767-1815). The only one among the lawyers of the Restoration, most of whom he had trained, not to be a high judge, or minister, or President of the Bar. His personal option for the judiciary and his death in 1814 deprived him of public honours. The Attorney General’s choice deprived him of ordinal consecration. Louis Brochon called Brochon junior (1779-1850) et Honoré Teyssier (1791-1863) will exemplify a strictly judicial tradition, with Faye, Lafon and Vaucher worthy epigones of the Second Republic. However, only the last quarter of the XIXth century witnessed the explosion of a generation, numerous and talented enough to perpetuate the "legend". René Roy de Clotte (1850-1915), Fernand Habasque (1851-1927), et Aurélien de Sèze (1850-1921), inaugurate a new era of the Bar. They will be followed some years after by Léonce Peyrecave (1840-1927), well known for his famous exordium "Let’s Close our Codes and open our hearts" that was at the height of sentimental pleading, reaping in the aquittals that no jury could refuse him, with not a single death penalty declared on any of his clients in eighty years of criminal work. 1927 The death of Habasque and Peyrecave, in 1927, marks the end of this last Triumvirate that had firmly maintained a tradition. But the era of the modern Bar had already arrived. Henri-Robert declared: "Paris doesn't have the monopoly of talented lawyers. If it were necessary to set up a prize list and give awards, I think that the Bar of Bordeaux would win. Three lawyers had a well- deserved reputation in France’s finest wine capital: Roy de Clotte, Habasque and Peyrecave". In the XXth century the Bar of Bordeaux developed, in the same way as all other large, modern Bars. It counted 350 members in 1980, and 800 in 2000. It has built up international ties through a policy of twinning, since the mid 197Os, with the biggest European Bars, such as Liège (Belgium), Bilbao (Spain), Bristol (England), Munich (Germany), Florence (Italy), Porto (Portugal), and well beyond the borders of the European Union with Casablanca (Morocco), Trujillo (Peru), Veliko Tarnovio (Bulgaria) and Sibiu (Rumania). 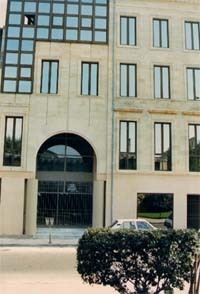 In 1984-85, its own " Maison de l’ Avocat " was built, housing many services, including the Regional Centre of Professional Training and occupying two buildings which are currently being extended. Copyright ©1999-2002 Bertrand Favreau and L.P.O. Editions. Copying prohibited. All rights reserved.